It's no ordinary hill: people develop personal, profound relationships with it. Watch people trogging up the hill, and then watch them coming down – singing, chatting, brightened and changed. Why? Here are a few clues. 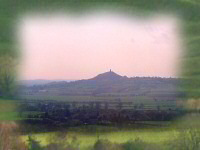 Glastonbury Tor is home to Gwyn ap Nudd, King of the Fairies. In the human realm it is managed by The National Trust. Page designed by Palden Jenkins, May 2005. Photos by Lesley Delamont, Bill Glenn and Kevin Redpath.